So, this is Game of Thrones season 6 final countdown. I am quite exited and ready. 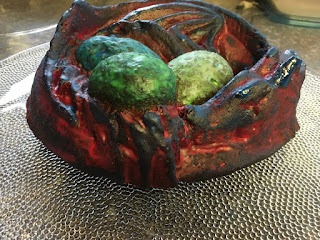 The current wife shares the feeling and last night she surprised me with a Dragon mold from Think Geek (they don't give me a commission...so you know). 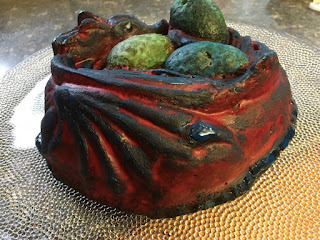 The following day, a rainy Friday, I was ready to bake my Game of Thrones cake. 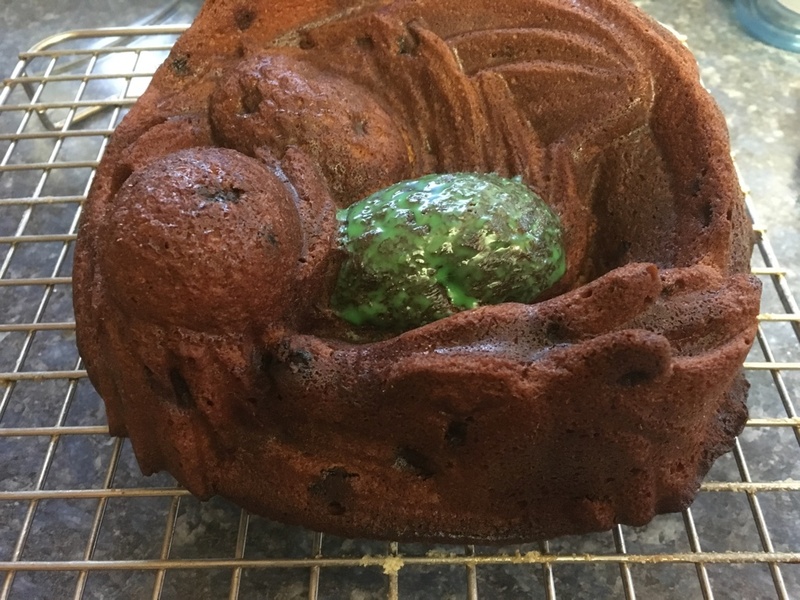 Obviously there are no recipes out there and I wanted a Dragon with the eggs cake, so i modified my Rum and Raisins cake (not published) and went crazy. 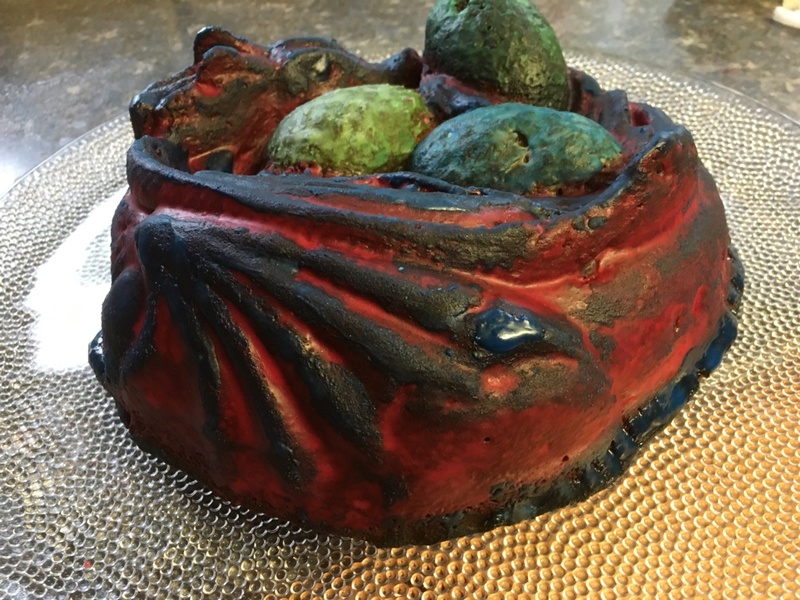 I couldn't find a way to use icing sugar to paint the cake and I don't like fondant, so I use my well known creativity and decided to mix my colors with different liquors (I know...) and, after 2 hours of ice sugar painting this is what I got. 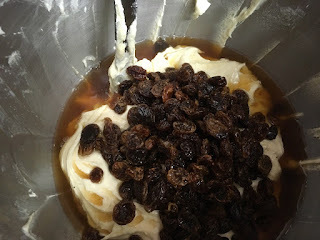 I know as a fact that the Rum and Raisins cake is fantastic...all I added was the creativity and some more alcohol -why not-. I dedicate my cake to the Lannisters, my favorite family. They make me realize that I had a GREAT family...they make me feel good. First slice in honor of King Joffrey that makes my son look like an angel. 3. In a bowl whisk together the flour and baking powder. 5. 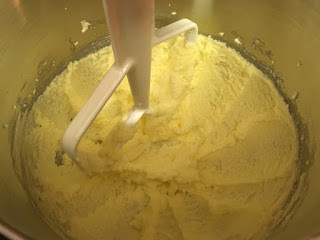 Add to the butter-sugar mix the eggs, one at a time, beating well after each addition (if they are small use 5 eggs). 7. 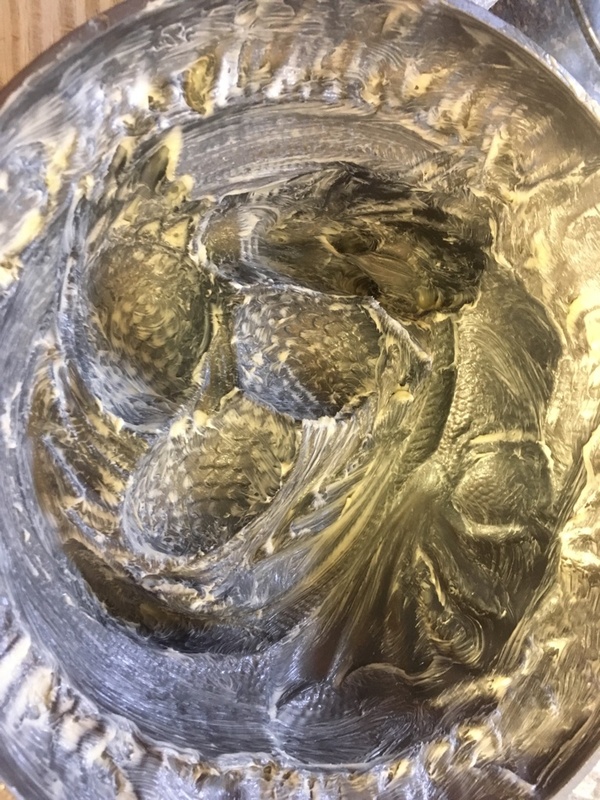 Pour the batter into the baking pan and get rid of the air bubbles by pounding it on the cooking table like crazy. toothpick and comes out clean. 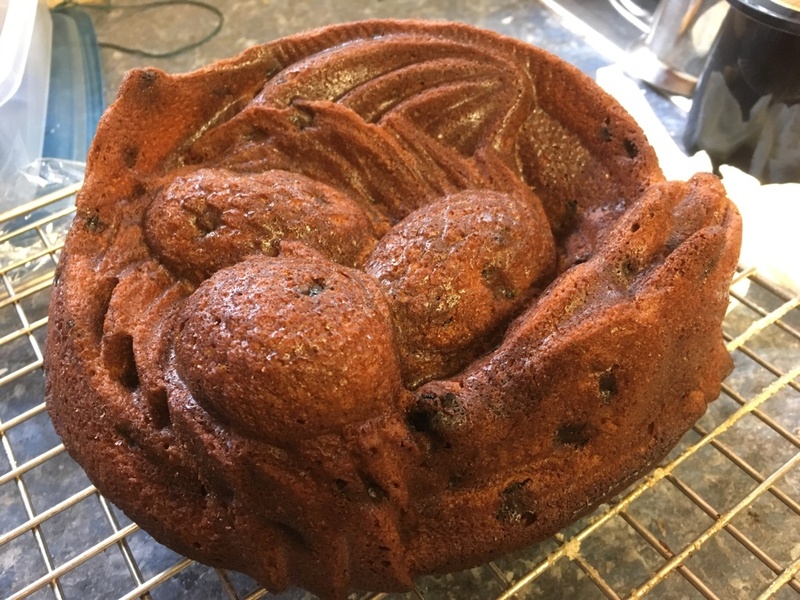 Because this is a thick cake most likely it will require more time than usual...don't worry...check every 10 minutes until the toothpick comes out clean (you don't want an under baked cake). If it takes 90 minutes, then so be it. 9. 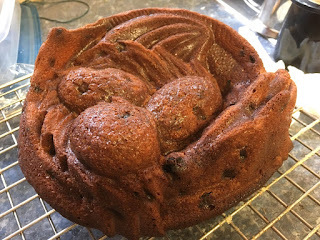 When the cake is ready, remove from the oven but keep it in the pan. Place the pan in a cooling rack. red coloring and a bit of Grand Marnier...add the Grand Marnier as needed. We are looking for a semi-wet (not wet-wet) mix. 2. 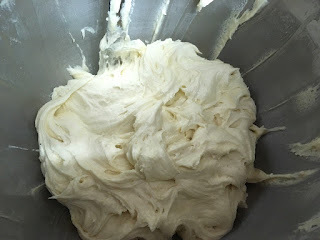 Mix the icing sugar with the red and the Grand Marnier until you get a smooth mix. Using a small paintbrush paint the dragon part trying not to touch anything else. At first it will look like nothing is happening. Don't worry. Repeat the same procedure until you see the dragon RED. I used two small bowls to get the texture right. 3. Clean the brush with cold water and repeat the procedure with the Green and some water. Do the first egg. 4. 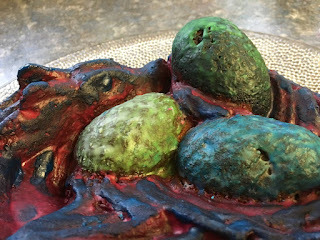 Then again clean and do the blue egg with the Curacao and the blue coloring. 5. Finally do the same with the green and the Vasari Nero...to get the dark egg. 6. Go back to your red and re-touch as needed and do some blue touches to enhance the Dragon's lines. 7. Allow it to cool for 3 hours and rectify if needed. I was "painting" my cake for almost 2 hours...it is worth while. 11. Turn on Game of Thrones... time for cake and whatever makes you happy. Enjoy! Today I won't be talking about a recipe. In this case a kidney recipe. 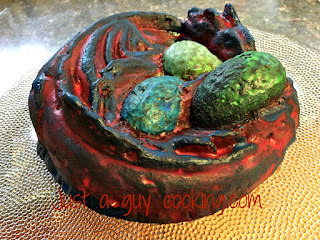 Today I will be talking about human kidneys, so if you are only into recipes, today is not your day. Today I want to talk about something that is extremely important to me: kidney transplant. It just happens that I have two birthdays: one that celebrates when I was born (I know...it should be a World wide festivity) but also I have my second time around birthday. Five years ago I received a kidney from a diseased organ donor. Today I am alive thanks to that person and I must honor that. My donor (and I will use "my" with the outmost respect) died unexpectedly and I was given a chance to live my life back to where it stopped 14 years prior. Those were 14 long years of which I spent 7 in dialysis. I have to be honest: dialysis is a great way to keep people going but is not a walk in the park. When I thought that the long 7 years in the kidney failure clinic was though as I was feeling worst as days past; dialysis took over and yes, I did feel way better but obviously never as I did before the whole ordeal. I had a terrific team of professionals who looked over me in the two stages. 99% of the time I found compassionate and caring people who understood what I was going through. The 1% is not worth mentioning. All my doctors still know me by my name. Most nurses do. I am lucky that way. Now I am taking care by another terrific team who make sure that I keep my kidney healthy and my spirits high. My own family doctor was with me the whole ordeal. He was and is great. I can't forget -not even for a second- what my family went through. When my world was collapsing in front of my eyes, my family was next to me and they suffered because they love me. My son was a small kid, now he is a man. My wife did everything to keep me going, and I mean everything. Obviously life didn't turn the way I planned, but at the end, I have a good life. I am very close to my family and they are close to me. I am lucky. Today I am 5. It has never been a moment when I don't think of the person who gave me more time to enjoy life. I promised I would do it for the two of us and I try very hard to keep my promise. Today somewhere there is a family who is remembering a loved one gone. Today I am celebrating life. Still today is hard to understand for me. Is there a word to say thank you for something like this? I don't know it but I know how I feel: that is the word I want to use. During the 19 years (today) when I started this long ride I have talked to people, I have listened to people and I have read what they have to say about organ transplant. People are funny that way; most people say they are in favor of donating their organs but only 30% do the proper paperwork, that is, 70% of those good intentions never become a reality. Nevertheless they think about it. They approve it. They want to be part of it. There is also a group of people who are totally convinced that organ transplant is wrong and shouldn't be allowed. Furiously they defend their beliefs and are ready to steamroll anyone who is in favor. I hear them, I listen to them and I read them but I don't understand them. I am sure they have their reasons and I respect that. What I don't respect is what is said about the whole issue. I recall that I was fresh out of the surgery room when I received a call to congratulate me (highly appreciated) but short after the same person sent me a letter saying that he/she was taking his/hers name of the organ donor list because -I quote- "we are not replacement parts". It hurt so much. I love that person but his word choosing was poor and the result was hurtful. Unintentional harm I want to believe. Life at the end. People at the end. I don't believe that there are good and bad people. I strongly believe that there is people. Just that, people. Today I celebrate 5 years and I want to share my feelings with you all. Donate if you feel is the right thing to do but, if you don't, please think twice before attacking the ones who are in favor. We are people same as you are. Try to understand and walk in our shoes. If that alters the way you think...great and if it doesn't...great too because everybody is responsible of their own destiny. My destiny was altered by the generosity of someone else. Today I celebrate 5 and I celebrate life. Let's have a Margarita and have a good laugh. Let's enjoy a good meal. Let's do something kind. Let's try no to harm others. Lets be people but let's be good people. It is not a secret that I like tequila. As I have stated in some of my previous posts I have been drinking tequila since I was 10. Actually not...since I was 14...Ok Ok...16. Usually I don't drink cocktails because I like the flavor of what I am drinking on its own -and my experiences with the mix of fruit juice and alcohol was not great way back then when I was young and beautiful-. Sometimes I drink a good Manhattan and my other mix drink is Margarita. The problem is that in most places Margaritas are just terrible. There is this conception that is a let's get drunk drink or a we are in Puerto Vallarta drink and in reality it is a fantastic cocktail. It is wrongly conceived so bad that they sell the "pre mixed" margarita!!! I am a perfectionist -kind of, not really- but when it comes to cooking I really pay attention. Now that Spring is approaching us AND the fact that the current wife gave me a kit to make ice spheres so I can mimic a Manhattan given to me in Mexico that was served inside (yes inside) a ice sphere. Those guys there (I can't say that it was the Four Seasons in Mexico because it would sound pretentious) know how to make a good drink shine. Their Manhattan was fantastic and, I can humbly say...my Margarita is fantastic too! Go crazy. Make one...try and prove me wrong. I have added some common questions and answers at the end of the recipe to answer before you even ask. The best (and real) Margarita Ever! 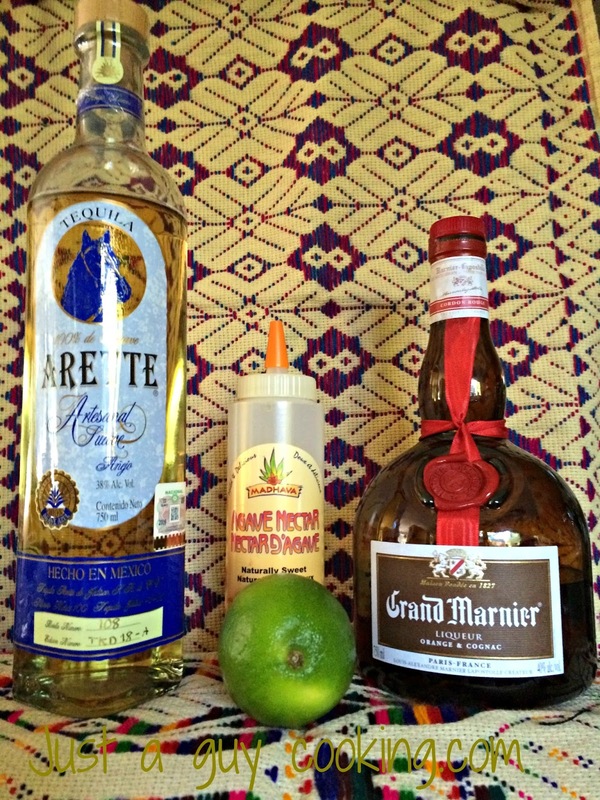 We are going to mix the Lime juice, the agave syrup, the Grand Marnier and the tequila. 2. Using a bartender mixer glass or something like that would do the trick, put tons of ice (at least 3/4 of the container) and pour the tequila mix. 3. Shake like crazy for about 1 minute, as we want the Margarita to be cold. 4. Using a strainer separate the ice from the Margarita. 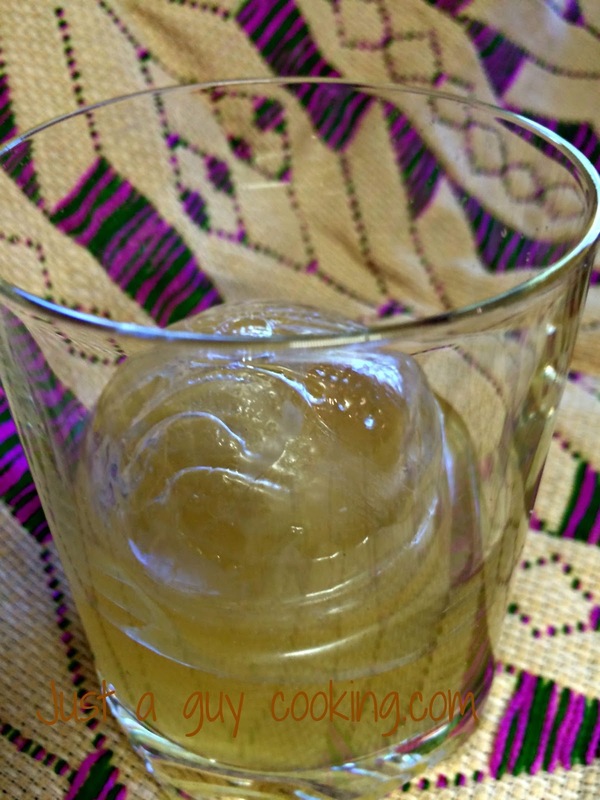 You can add ONE big ice cube -or sphere- so it keeps it cool but doesn’t make it watery…. -Can I use Couintrau instead of Grand Marnier? -Yes you can. I like the taste of the Grand Marnier for this drink, but you can use Couintreau also. I use a cheap tequila, right? Not at all. The most important part of the cocktail is the tequila. Using cheap tequila will equal a cheap flavored drink. A good cocktail needs good ingredients. I use reposado, but you can use regular, Añejo or Platino or diamane…up to you. 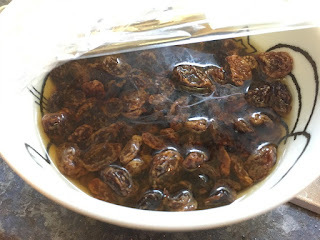 Can I substitute the Agave syrup for something else, like sugar or honey? - No. sorry the agave syrup and the tequila come from the same plant. The flavors just work. - I like Ice cream too but this is a cocktail not sorbet. The crushed ice will just water down the drink. No point in that, right? And…the salt on the glass rim? -I feel that the salt adds nothing to the drink and only adds an unwanted flavor to it. -I don’t have tequila can I use white rum, for example?